The excavations at Hog Croft, Ovingdean, continue to reveal many features and artefacts and we need all the information the site has to offer to help to interpret these finds. This involves methodical procedures to recover all this information. It is not always exciting and sometimes tedious! Why do we sieve the top soil and collect all the loose mortar, pro-fessional groups 'would just discard the topsoil'? I am sure that on many professional digs this happens, but they have time con-straints that, thankfully, we do not. Having permission to excavate an archaeologically rich site bestows a responsibility to make best use of the opportunity. I have started quantifying the distribution of finds and, using David Staveley's excellent Snuffler software, started to produce density plots of the distribution of artefacts by weight. Although incomplete this work has produced some tentative results. 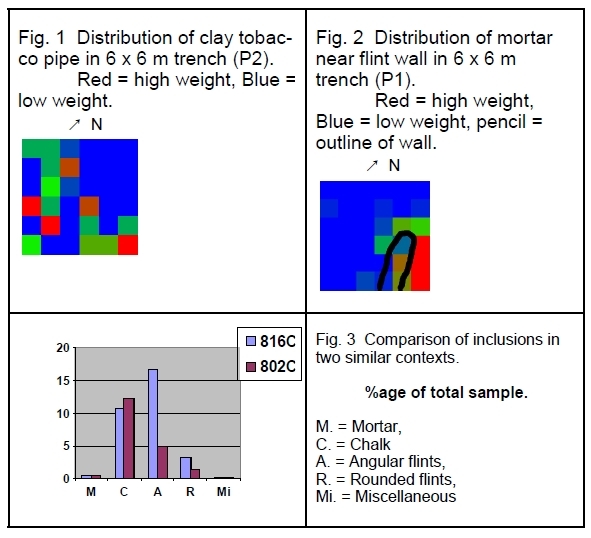 The distribution of tobacco clay pipe fragments in the top soil of the South trench (Trench P2) is concentrated in the South of the trench. (Fig. 1). This ties in with a distribution of post medieval ar-tefacts around a depression noted last year and helps to build a picture of a localised area of post medieval activity. We have collected lots of mortar fragments from soil in the lower strata downhill of the mortared wall in the North Trench, P1 (Fig. 2). By weighing these fragments we have an idea of what quantities to expect in similar circumstances. What if a wall has been completely robbed out? Could we use the residual concentration of mortar fragments to infer the previous existence of a mortared structure in that area? Diggers have collected soil samples from various areas. These samples are being sieved and the fraction over 0.75 cm has been sorted into various categories of inclusion including chalk, angular flints, rounded flints and mortar. Preliminary results show amarked difference between superficially similar contexts (Fig. 3). These differences can be easily overlooked when excavating. Maybe this method will reveal unexpected information that can tell us something more about the site. Archaeology can be exciting. Finding a 'treasure' can, and should, be a great personal experience, but, contributing to the routine and sometimes tedious tasks that are a necessary part of our endeavours should also be a source of personal satisfaction. I am very grateful that we have a team that is so very willing to 'give it a go', even when it is not very exciting!